This fast-paced sequel to Smuggler's Blues is a harrowing and at times comical journey through the criminal justice system at the height of America's War on Plants. Captured in the lobby of the Sheraton Senator Hotel at LAX following a fifteen-year run smuggling marijuana and hashish as part of the hippie mafia, Richard Stratton began a new journey. 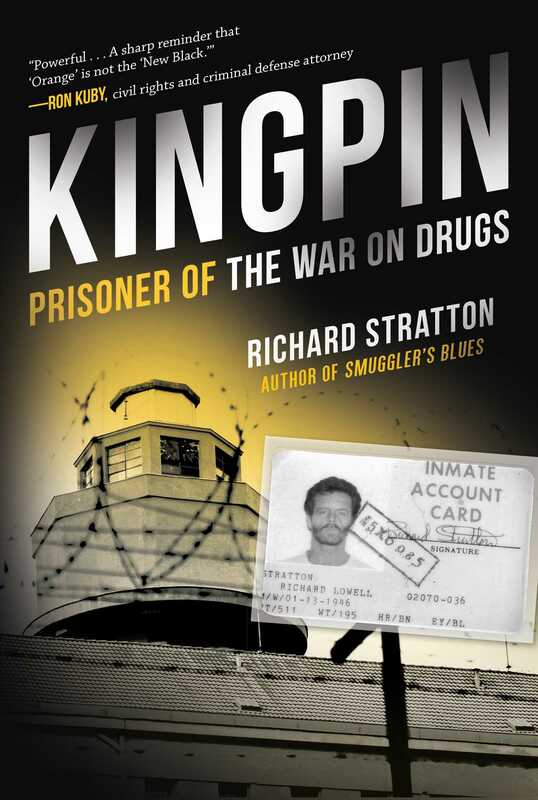 Kingpin tells the story of the eight years that followed, through two federal trials and the underworld of the federal prison system, at a time when it was undergoing unprecedented expansion due to the War on Drugs. Stratton was shipped by bus from LA's notorious Glass House to jails and prisons across the country, a softening process known as diesel therapy. Resisting pressure to falsely implicate his friend and mentor, Norman Mailer, he was convicted in his second trial under the kingpin statute and sentenced to twenty-five years without the possibility of parole. While doing time in prisons from Manhattan's Criminal Hilton to rural Pennsylvania, Virginia, Kentucky, and New York, he witnessed brutality as well as camaraderie, rampant trafficking of contraband, and crimes by both guards and convicts. He first learned the lessons of survival. Then he learned to prevail, becoming a jailhouse lawyer and winning the reversal of his kingpin sentence and eventual release. Kingpin includes cameos by Norman Mailer, Muhammad Ali, and John Gotti, and an account of the author's friendship with mafia don Joe Stassi, a legendary hitman from the early days of the mob who knew gangsters Meyer Lansky, Bugsy Siegel, and Abe Zwillman and has insights into the killing of Dutch Schultz and the Kennedy assassination. Kingpin is the second volume in Richard Stratton's trilogy, Remembrance of the War on Plants. Richard Stratton is also the author of the cult classic novel Smack Goddess and an award-winning journalist and filmmaker. He was a writer and consultant for HBO’s Oz and the creator, writer, and executive producer of Showtime’s Street Time. He is a court-certified expert on prison culture, prison violence, and international drug trafficking. As a journalist, he won a New York Press Club award for his magazine article “Godfather and Son.” He was the founder of the magazine Prison Life and an editor and publisher of High Times. He lives with his wife and children in New York City.